Combining almost opposite ends of the electromagnetic spectrum, this composite of the Herschel in far-infrared and XMM-Newton's X-ray images shows how the hot young stars detected by the X-ray observations are sculpting and interacting with the surrounding ultra-cool gas and dust, which, at only a few degrees above absolute zero, is the critical material for star formation itself. Both wavelengths would be blocked by Earth's atmosphere, so are critical to our understanding of the lifecycle of stars. A pair of European space telescopes has snapped a stunning new view of one of the most iconic deep-space objects ever seen: the Eagle nebula. The Eagle nebula is a distant star-forming nest of gas and dust about 6,500 light-years from Earth in the constellation Serpens. The nebula gained notoriety in 1995, when NASA's Hubble Space Telescope revealed vast pillar-like structures — the so-called "Pillars of Creation" — in a picture that remains one of the most iconic space photos ever recorded. The new Eagle nebula photo, released today (Jan. 17), is actually a combination of views from the European Space Agency's infrared Herschel space observatory and the XMM-Newton X-ray telescope. For astronomers, the new views of the Eagle nebula are a must-see in order to observe small clumps of material known as "evaporating gaseous globules," or EGGs, in the nebula's pillars. Astronomers have long-suspected that stars were being born inside some of the Eagle nebula EGGs, but the Hubble Space Telescope was unable to peer inside them using its visible light camera, ESA officials said. "In visible wavelengths, the nebula shines mainly due to reflected starlight and hot gas filling the giant cavity, covering the surfaces of the pillars and other dusty structures," ESA officials explained in a statement. "At near-infrared wavelengths, the dust becomes almost transparent and the pillars practically vanish. In far-infrared, Herschel detects this cold dust and the pillars reappear, this time glowing in their own light." Messier 16 is a diffuse emission nebula that contains the young open cluster NGC6611. The iconic 'Pillars of Creation' image taken with the Hubble Space Telescope in 1995 is captured in near-infrared by the VLT, which penetrates straight through the obscuring gas and dust, rendering them almost invisible. The pillars are only a small portion of the extensive nebulous region imaged in far-infrared by ESA's Herschel Space Observatory, which shows cool dust and gas tendrils being carved away by the hot stars seen in the X-ray image from XMM-Newton. The wide-field optical image from the ESO MPG telescope puts the pillars into context against the full scale of the nebula, which is over 75 light-years across. 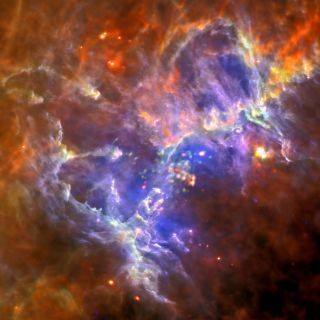 The Herschel observatory's infrared images revealed wispy tendrils of dust and gas permeating the Eagle nebula. The XMM-Newton spacecraft, meanwhile, helped track ultraviolet light from the nebula's hot stars. Past infrared observations of the Eagle nebula have revealed hints that the iconic Pillars of Creation inside the Eagle nebula may actually no longer exist, and the new observations appear to support that scenario, ESA officials said. The observations suggest that one of the stars inside the NGC 6611 cluster exploded about 6,000 years ago, erupting in a supernova that destroyed the nebula's "Pillars of Creation." Since the Eagle nebula is 6,500 light-years away, its light takes about 6,500 years to reach Earth and telescopes today reveal the nebula as it existed in the distant past. The supernova event and destruction of the pillars won't be visible for at least another few hundred years, ESA officials said.